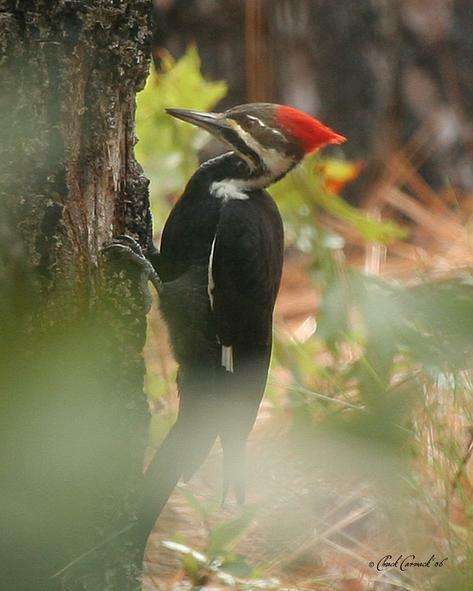 Pileated woodpeckers are the largest North American woodpecker measuring an impressive 19" in length! They have all-black bodies with white facial stripes and a brilliant red crest. Pileated woodpeckers are cavity nesters and excavate holes in large dead trees. Range: Pileated woodpeckers are found mostly in the eastern United States, northern California, and Canada. They do not migrate. Pileated woodpeckers prefer to live in woodlands with large trees, but they also inhabit suburban areas where tall trees are present. Diet: Pileated woodpeckers eat mainly insects found by hammering at dead wood. They also eat fruits and nuts and they will come to suet feeders. At Wild Bird and Garden we have foods that pileated woodpeckers love like our Woodpecker Favorite seed mix, peanut suet, and woodpecker cake suet. We also have oversized suet feeders in stock designed especially for pileated woodpeckers!